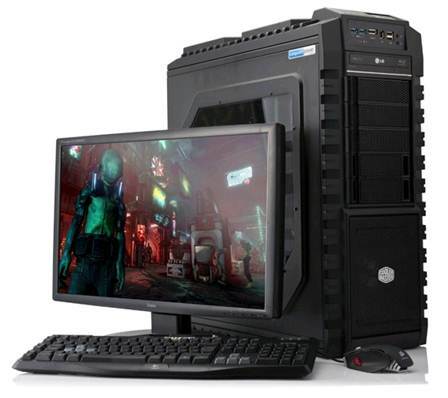 At the more expensive part, there is i7 Extreme Gaming PC of Computer Planet, a computer looking like it’s aiming at the company. Enormous Cooler Master HAF-X chassis creates an imposing system, and is covered in protruding fan points which seem coarse and many external drive bays that can be hot-swap. It also has 1 transparent panel at the sides on which one large cooling fan is fit up. Through this panel, you can see an interesting illumination, which also shine through the grid on the top of the chassis. You will also notice the Corsair H80 liquid-cooling heat sink comes along with 2-fan cooled heat sink and attach to the back of the chassis. Corsair Force GS 240GB SSD drive and 1TB Seagate hard drive are put in the horizontal cases, 5 in total. SSD drive provides double-capacity storage as compared to the rivals, and it’s enough to save some games. 2 Corsair Vengeanace Red 4GB memory modules are set up to provide a nice contrast with the blue surface of the Gigabyte GA-Z77-DH3 motherboard. Also present here, there are overclocked nVidia GeForce GTX 680 graphics card and accelerated Creative Sound Blaster Recon 3D sound card. “HAF” suffix of Cooler Master chassis refers to High Air Flow, which is an important thing to overclocked systems using fan cooler. Inside, there are lots of places and the cable system is extremely neat to have maximum air circulation. You also have more places to insert another graphics card if the motherboard supports this ability. “HAF” suffix of Cooler Master chassis refers to High Air Flow, which is an important thing to overclocked systems using fan cooler. The power switch, reset and LED of the fan can be hidden behind the sliding panel in order to stop you from unintentionally turning off the system when feeling your way with one of many front USB ports. Equipped with Intel Core i7-3770K microprocessor overclocked to 4.3GHz, this PC provides the best overall operating performance here, as assessed by PCMark 7. Game performance is also excellent. Beside Iiyama equipped with HDMI 24in, Computer Planet provides gaming keyboard and dedicated mouse. · This is an expensive yet incredibly fast PC designed with high standards. Big SSD 240GB drive of course is a plus and the large system chassis provides a lot of room to expand.